The coffin seized in Miami was originally thought to belong to a 21st Dynasty (Third Intermediate Period) pharaoh. Indeed, initial reports, attributed to Zahi Hawass, suggested that it had left Egypt in the 1884. The coffin had been sent to North America from a Spanish galerista based in Barcelona. It was detained in October 2008 after arriving in Miami via Ireland. A member of the US Customs service spotted that the coffin was not accompanied by appropriate documentation that would demonstrate its collecting history (or provenance). The item had been sent to an unnamed US dealer; it was claimed that it had already been sold to an anonymous Canadian collector. Subsequent research showed that the Third Intermediate Coffin belonged to an individual named as Imesy. Reports in the Spanish press suggested that it had been acquired by a Spanish collector in the 1970s; these suggestions bring into question the earlier report that the coffin had left Egypt in the 19th century. Although the Barcelona gallery initially challenged the detention, the legal case was withdrawn. It appears that the galerista was unable to produce paperwork that could demonstrate conclusively how the coffin had come into his (temporary) possession. The Barcelona gallery, "Arqueología Clásica" (proprietor Félix Cervera), was, at the time, a probationary member of the International Association of Dealers in Ancient Art (IADAA). (The gallery's membership is reported to have lapsed at the end of 2009.) The code of ethics for the IADAA includes the statement, "The members of IADAA undertake not to purchase or sell objects until they have established to the best of their ability that such objects were not stolen from excavations, architectural monuments, public institutions or private property.". The Barcelona gallery was named in the Italian investigation codenamed "Operation Ghelas". This operation apprehended a number of individuals handling recently surfaced antiquities from Sicily and southern Italy. The objects were apparently being passed onto the European and North American markets via dealers in Switzerland, Germany and Spain. In March 2010 the seized Egyptian coffin was handed over to Dr Zahi Hawass in order for it to be returned to Egypt. Hawass acknowledged the partnership between Egypt and the US in keeping a check on the trade in recently surfaced antiquities. The plan is to place the coffin on display in Egypt. The case is a reminder that there appear to be dealers and others associated with the movement of cultural property who still persist in bringing antiquities into the USA without the appropriate documentation. 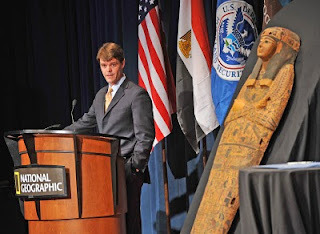 The case should also encourage the resolve of the US Immigration and Customs Enforcement (ICE) as they seek to protect the world's cultural heritage. David- Even if the coffin left Egypt as late as the 1970's as is now claimed that is still well before 1983 when Egypt unambiguously declared artifacts found in the ground state property. Please explain the legal basis for Egypt's entitlement to the coffin then other than the fact that the dealer could not stomach a protracted battle with US Customs thousands of miles from home. Also, you persist on linking the Baltimore Test case to a whole host of unrelated matters. Are you suggesting the ACCG does not have a right to test government regulations in US courts under the constraints imposed by standing requirements that may require the test case be preceded by an actual import? I presume that if this coffin had a distinguished collecting history (some call it "provenance"), then the dealer (at the time a member of the IADAA) could have produced the appropriate documentation. He was unable to do so. How did the galerista acquire the coffin? Why has he been so silent? The galerista had sold the coffin to a dealer in North America. He or she would have been much closer to the seizure - and he or she would presumably have been able to produce the documentation. This is not about Egypt's "legal basis" but about the right of US authorities such as ICE to deem what can be moved legally across US borders. They have a responsibility to detain suspicious imports. Do we know it was a US "dealer" who bought it Mr Tompa? I had assumed it was a collector. Do you know who was involved, and is this US antiquities dealer an affiliate member of the ACCG which you represent? I am a bit puzzled by the reference to 1983, as I am sure a top cultural property legal expert as Mr Tompa is aware that Egypt's first antiquities protection law go back to (at least) 1835, and already the March 1874 one made antiquities still in the ground state property (pretty unambiguously as this was the basis for excavation permits and partage agreements with the Egyptian government). The June 1912one already was restricting exports by licences. So 1983 is not the only date relevant. But it is all irrelevant as not one scrap of paper was offered to show the item had left Egypt legally by either seller or buyer. So if Egypt is not according to Tompa "entitled" to the seized coffin, who is? As for the Baltimore Illegal Coin Import stunt... I think it is very closely linked to precisely such cases as this. The stunt (see also the recent ACCG manifesto "Coin collectors and Cultural Property Nationalism") is unambiguously intended to challenge precisely the sort of border controls that revealed the irregularities which led to this item being refused entry into the US. Does the ACCG have the legal right to challenge the US government over its willingness to respect its international responsibilities, yes it does. Does it have the MORAL right to hinder such attempts? I would say no. Despite all the whinging arguments offered in support of this scandalous action, I say that the US dealers and collectors behind this are acting totally immorally in self-interest in order to uphold unethical trading practices as long as possible. That is my personal opinion of course. For further information on "Operation Ghelas" and its relevance to the market in ancient coins see SAFE.